This article was originally published on the WordBee Blog. Neural networks, neural machine translation, speech-to-speech technology, blockchain, translator implants in our brains, automated interpreting, mind reading computers, digital twins, ambient intelligence. In one word: artificial intelligence. 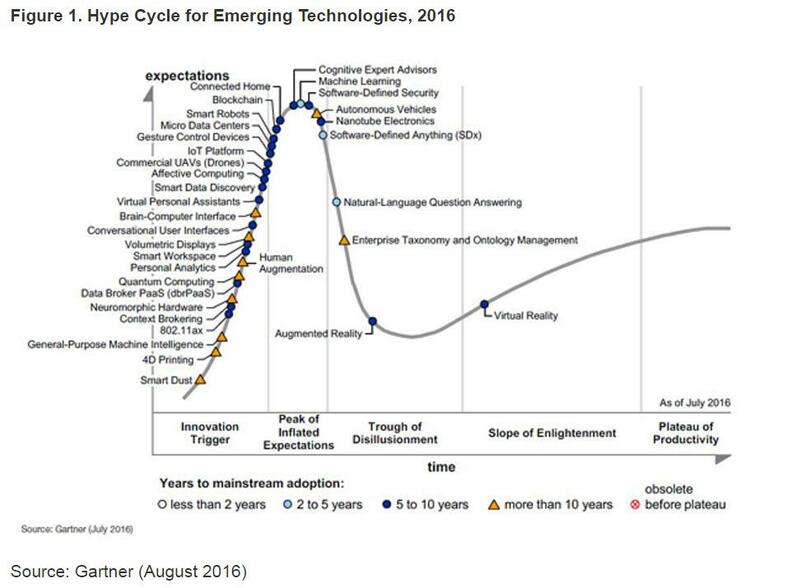 Are all these technologies hypes that will deflate in time? Or will they become relevant to our business? A hype is born out of excessive expectations centered on an event, a technology or a trend. 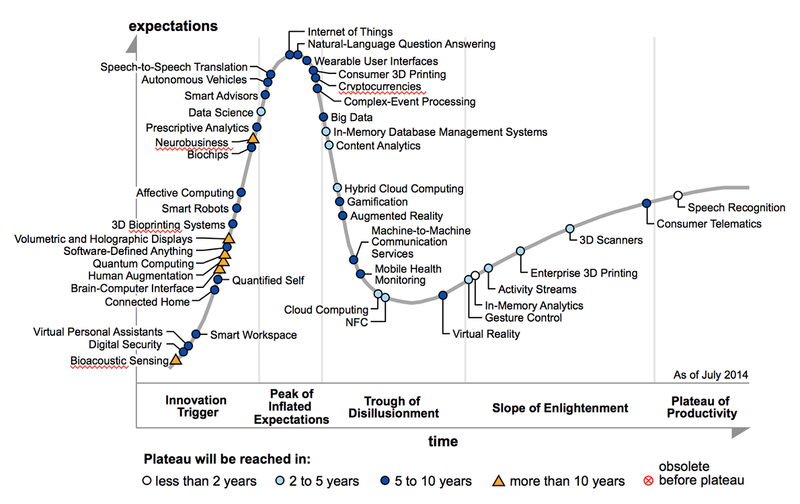 The Gartner Hype Cycle for emerging technologies talks specifically about a phase of “inflated expectations,” which happens when we hear only about the success stories of a new technology and neglect to listen to the failures. The American research and information technology firm Gartner calls the first phase of a hype cycle Innovation Trigger, when a potential technological breakthrough attracts a lot of media attention but there are no products commercially viable. The second phase is the above-mentioned Peak of Inflated Expectations. 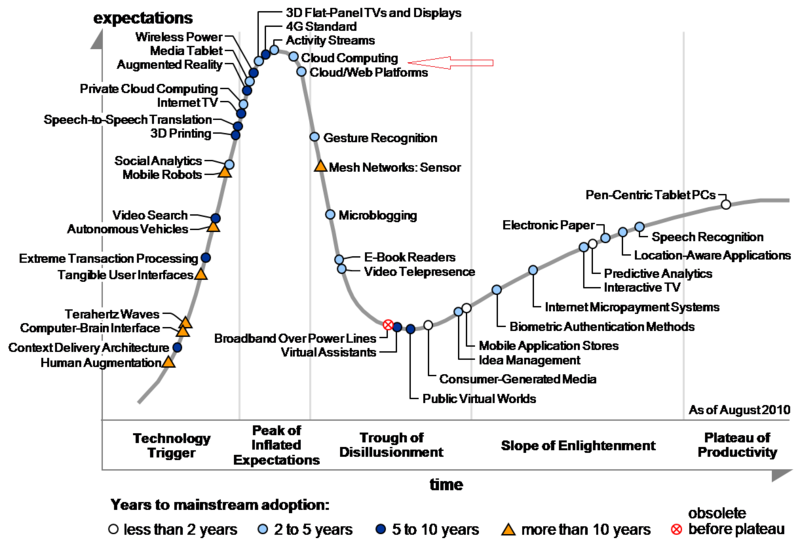 It is followed by the Trough of Disillusionment (when experiments and implementations fail to deliver) and the Slope of Enlightenment (when second and third generation applications are starting to attract attention and respond to early users’ needs). The final phase is the Plateau of Productivity when the technology has reached a certain maturity level and its application is finally viable and will continue to grow. 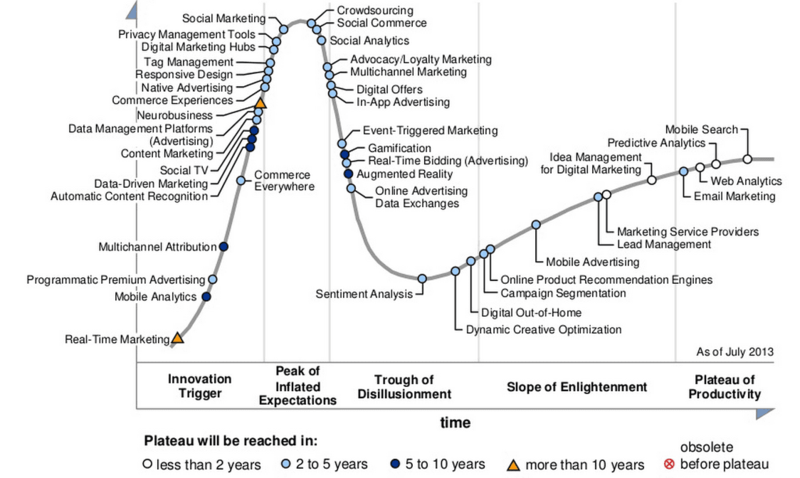 A hype cycle lasts on average 5 years before a technology either deflates or enters the maturity phase. One example from the past that ended in failure? Network computers, i.e. diskless desktop computers developed by Oracle, IBM and Sun Microsystems, among others, in the attempt to prevent Microsoft from dominating the market. Another example with a positive outcome? 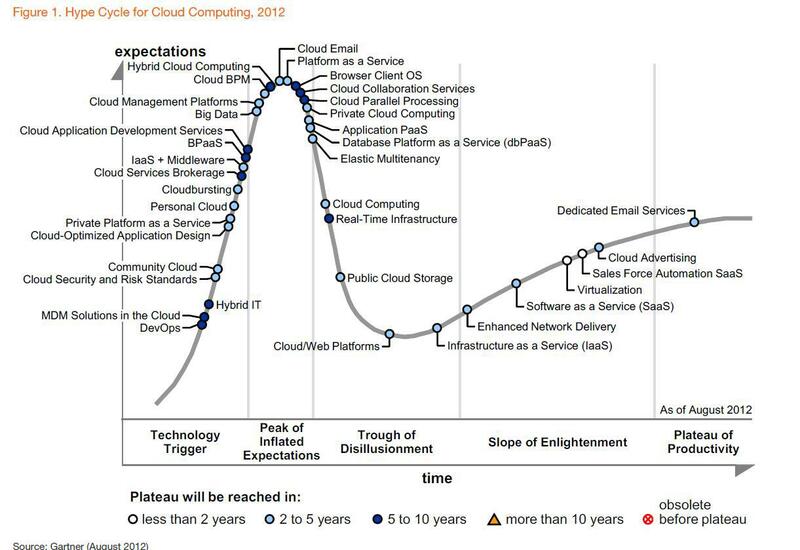 The cloud, a rather popular solution nowadays that some years ago was still a hype. Even now, the cloud evokes a certain degree of skepticism among many. A more recent hype has to do with blockchain, the open-source technology on which Bitcoin — another hype — is based. By nature, blockchain allows for transparent transactions, any kind of transaction. Not just as a payment method — especially when added to a SaaS platform — but also to keep a complete history of any project in a transparent and permanent way. Although apparently easy to implement, the blockchain technology requires a lot of resources not easily available to most translation industry players, even the biggest ones. For example, any transaction should be validated; and when it comes to cryptocurrencies like Bitcoin, this may prove expensive. Another major problem with cryptocurrencies lies in finding the right one, due to negotiation issues. Finally, no one within the translation industry right now probably has the necessary human and technological resources to support cryptocurrencies. Artificial intelligence — robots taking over our work and the whole world — is a very scary hype right now that reaches the translation industry as well. Two years ago, Forrester Research already predicted that by 2021 a net 6% of all jobs will be in the capable hands of robots and machines. Will robots really take our place? Hardly. First, unlike humans, robots are not sentient beings. A robot/computer might pass the Turing test — if properly hidden from a person — but it’s highly unlikely that it can recognize whether it’s dealing with a human or with another machine. Instead of focusing so much on the threat posed by artificial intelligence to humans, we should focus on automating as many repetitive tasks as possible, which will free us to develop more interesting skills and activities. 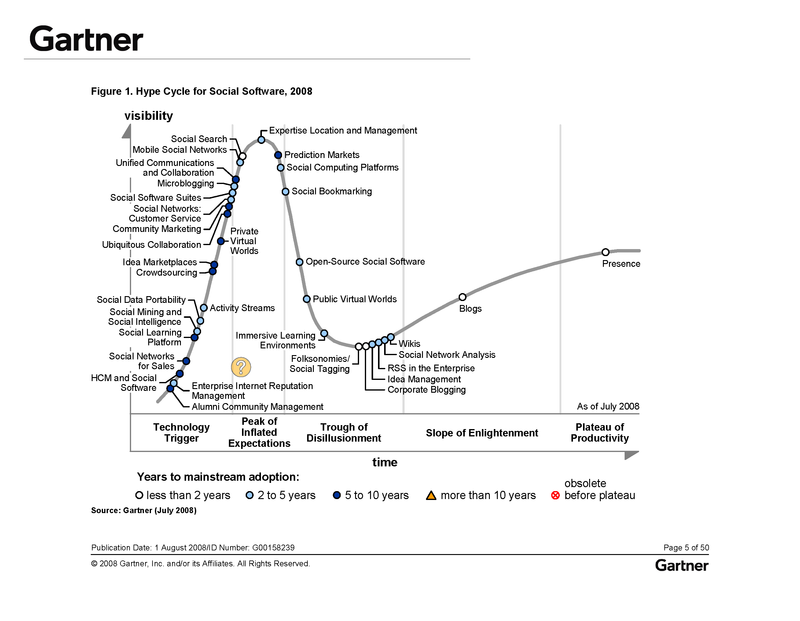 First, it is useful to look at the last 10 years of the Gartner hype cycle. The following table offers an overview of the hypes since 2008. Click on the year to view the graph. You’ll see that the only constant hype is speech-to-speech technology and that machine translation has instead reached the Plateau of Productivity. And quite rightly: machine translation has been in use for the last decennia and since 2006, thanks to Google Translate, it has become widely available. Machine learning is still a hype, according to the Gartner graph: its peak started three years ago when Google and Microsoft released for free (or almost for free) ML algorithms and application platforms. So, how do we survive technological hypes if we don’t know what’s real and what’s not? No need to turn into Luddites, nor is it necessary to try and disrupt at all costs. Instead, collect as much information as you can from independent sources and collaborate with your technology provider. Why? Because no LSP or company has the resources to develop and maximize technology — unless they’re Google, Amazon, Apple or a few others. Algorithms will be the new coffee of 21st century, a new commodity. But we need to identify which algorithms are needed, learn to use them, as well as identify, learn and use the data to go with them. Therefore, know your data — both linguistic and project data. Use it to develop a totally new approach to your translation projects and new services with a higher added value. Finally: Automate, automate, automate. Exploit technology to minimize repetitive tasks and overhead; focus your time — and your co-workers’ time — on something worthwhile. Through automation you can, among other things, reduce costs, errors and inconsistencies; increase productivity and readiness.